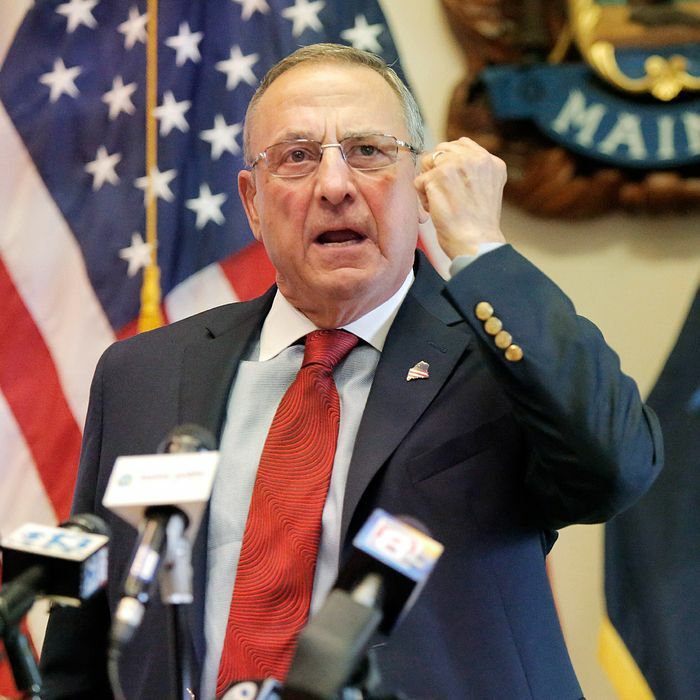 Nobody ever accused Maine governor Paul LePage of being a politician who seeks consensus. The fiery conservative was first elected in 2010 by winning a booming 37 percent of the vote in both the primary and the general election (an independent candidate won 36 percent). He did much better in 2014, aided by a pro-Republican midterm climate, an anti-bear-hunting initiative that goosed rural turnout, and yet another independent candidacy, but still fell short of a majority. But LePage doesn’t seem to mind contravening the will of the people. As he navigates his last year in office (he’s term-limited in 2018), he’s refusing to implement a ballot initiative approved by 59 percent of Maine voters last November aimed at forcing a Medicaid expansion that LePage has blocked throughout his tenure (he’s vetoed legislative measures to take advantage of the expanded coverage and federal “super-match” funding on five separate occasions). In a Dec. 11 letter to legislative leaders, LePage laid out a number of conditions, including that there be no tax increases, that money from the budget stabilization fund is not tapped, that the funding mechanism be ongoing, and that waitlists for services for elderly and disabled people be eliminated before state government pays to expand Medicaid eligibility. Obamacare supporters in Maine say the LePage administration has already ignored timelines mandated by the ballot initiative. Maine earlier this month skipped a deadline to file routine paperwork notifying the Centers for Medicare and Medicaid Services it would join the Obamacare expansion. The governor has also helped produce a legislative deadlock over the appropriation of funds to begin the expansion, which was supposed to begin on July 2, with 80,000 l0w-income Maine residents becoming eligible for Medicaid. It’s looking now like litigation is the only avenue for implementing the initiative — though its mandate will remain in effect into 2019, when LePage will be off somewhere ranting and snarling as a private citizen (unless he’s offered a gig in the Trump administration). Advocates pushing for ballot measures say they’re not discouraged by the Maine dispute because they expect other states would defer to their voters if they approved the program. Utah will probably have a similar ballot initiative this fall.